The first time I met Sheldon Vanauken at his home, Vancot, in Lynchburg, Virginia, I perused with a sense of awe his library containing early editions of C. S. Lewis's works. I told Van it gave me a sense of being very close to Lewis, in a way. Some may think this silly, others will understand. Van told me I was welcome to come back and enjoy his books any time. Sadly, that is no longer possible. But since that time I have been blessed with my own collection of C. S. Lewis first editions. Most of these have come to me as gifts from friends. Or I have purchased some when friends have given me a monetary gift to be used for this purpose. Otherwise I would find it very hard to spend the money on first editions of books I already have in very trusty paperback copies. I was talking to another collector of Lewis first editions recently. 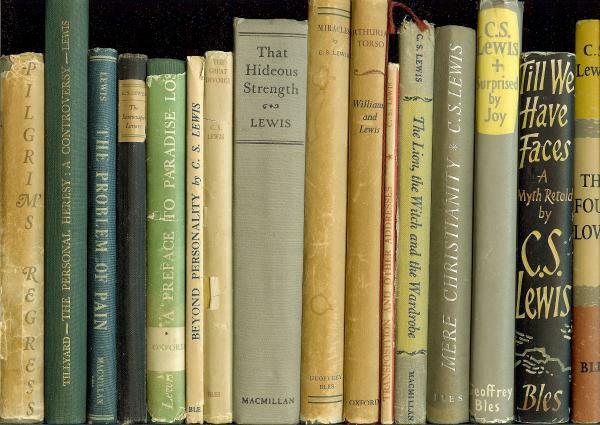 We both agreed that what we enjoyed about having early editions of Lewis's works is that the feel and even the smell of these old books takes us back, in a way, to the time period in which they were written. Of course one must beware of becoming so interested in books themselves that one forgets what the books are really about--content. But having enjoyed the content of Lewis's writing over the years, those of us who collect first editions of his works, now have a special appreciation for the conveyors of that content. If you are a collector of Lewis first editions or would like to become one and want to know more--e-mail me. C. S. Lewis bibliophiles need to stick together! To learn more about collecting C. S. Lewis first editions I recommend purchasing Ed Brown's book: In Pursuit of C. S. Lewis: Adventures in Collecting his Works.